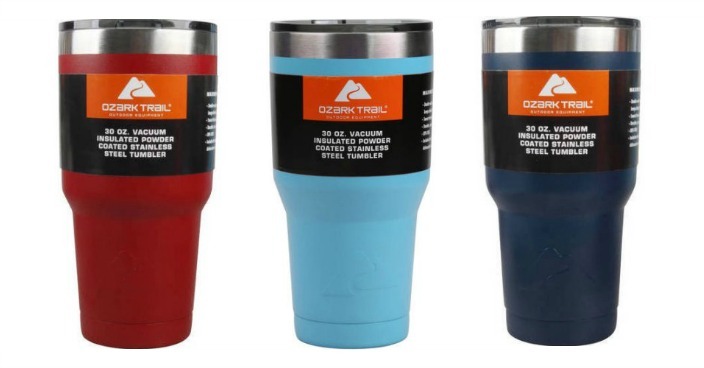 Ozark Trail 30-Ounce Double-Wall, Vacuum-Sealed Tumbler Just $9.74! You are here: Home / Great Deals / Ozark Trail 30-Ounce Double-Wall, Vacuum-Sealed Tumbler Just $9.74! Right now you can get this Ozark Trail 30-Ounce Double-Wall, Vacuum-Sealed Tumbler for just $9.74 at Walmart! Whether your’re on a camping adventure or jumping into your car for your morning commute, you can keep your thirst under control with this handsome and durable Ozark Trail tumbler. This 30-ounce travel tumbler is made with high-grade 18/8 stainless steel, and is double-walled and vacuum-sealed for maximum temperature control, so it’s equally suited to sustaining the temperature of both hot and cold beverages. Whether you like to keep your sweet tea chilled on a hot summer day, or would rather keep your hot coffee from going lukewarm 10 minutes into your commute, this travel cup has you covered. Featuring a durable, rust-proof and sweat-free design, this stainless steel tumbler is BPA-free and comes with a lifetime warranty.